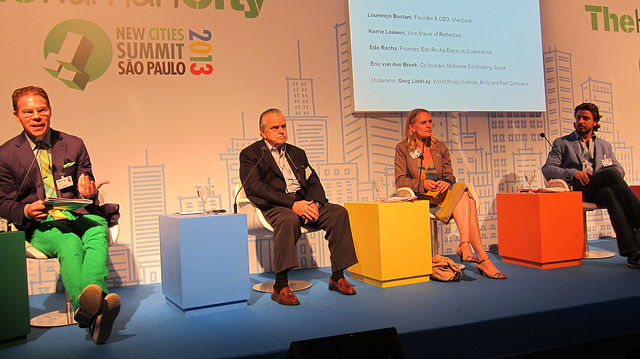 It has been another marvellous day at the New Cities Summit 2013 here in São Paulo where I live and work. 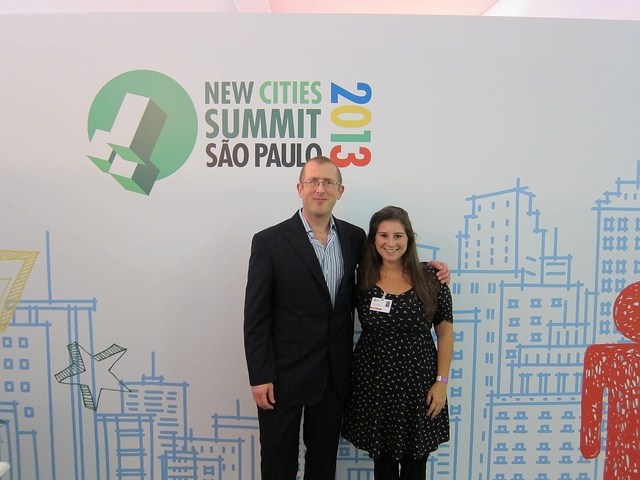 I really want to start by mentioning my good friend Alice who is the local co-ordinator of the New Cities Foundation for Brazil. Alice has been working around the clock these last few months with the rest of the NCF team to make the event a reality, and I am extremely grateful to alice for inviting me to take part. 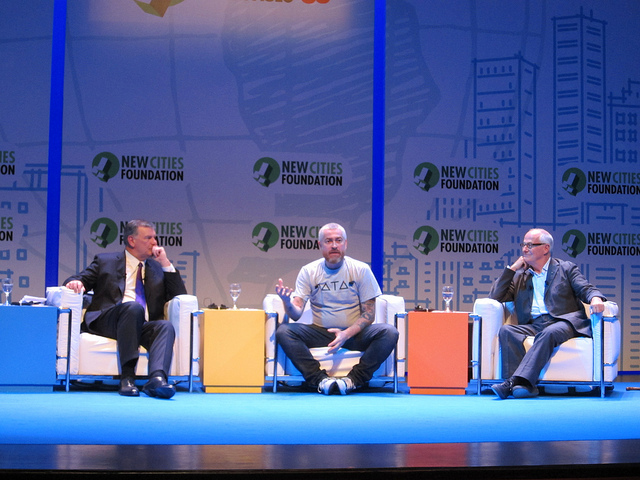 I realise in my article about day one of the summit that I did not really introduce the New Cities Foundation, so I asked Alice if she could summarise what it was trying to achieve. Alice told me that the foundation is focussed on seeking technological problems to the pressing issue of ever-growing urbanisation, and it does not see any one single stakeholder being able to solve the great problems. Rather, solutions will emerge from a wide range of partnerships, and the New Cities Foundation is positioning itself as one of the world’s leading organisations hosting key summits around the world bringing together businesses, governments, NGOs and academics. here in Brazil the foundation is also involved in an e-health project in Rio de Janeiro, which is examining how technology can provide revolutionary and cost-effective health care to some of the most under privileged members of society. 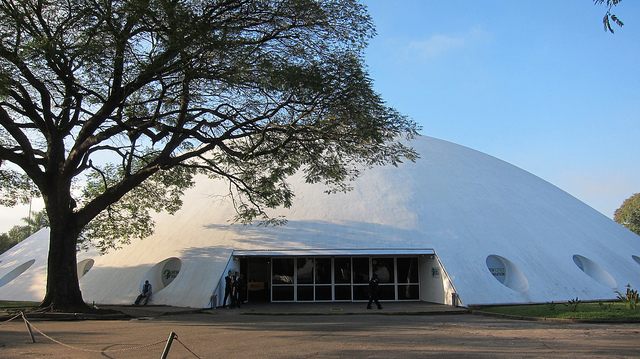 As well as the pavilion which I showed yesterday, the other building where the summit was being held was in the UFO-like pavilion, also designed by Brazilian architect Oscar Niemeyer in the 1950s. Despite the legendary traffic problems in São Paulo, I arrived quite earlier with no hold-ups, and so I caught up with my good friends from Symnetics over an early coffee. My wife maria is the Director of Education at Symnetics, and she is responsible for the Strategy Execution Summit held in São Paulo each year. I have attended this in the last two years, 2012 and 2011 and it has given me a very different perspective on just how focussed the top companies are on both delivering excellence in business strategy, and also on the issues of sustainability. The reason I say this was that this point was picked up by Edo Rocha, an architect talking at one of the breakout sessions today. It always depresses me when I see my Brazilian friends get down over the many challenges here, and these are huge and not to be underestimated. But I talked to the guys this morning about my own experiences in technology in the UK in the 1990s when the internet was really exploding in Europe, Asia and the US, and so I will expand on this conversation when talking out the breakout session in more detail in a bit. Before doing so I would like to first mention the opening plenary, which was one of the most diverse panels you could imagine. 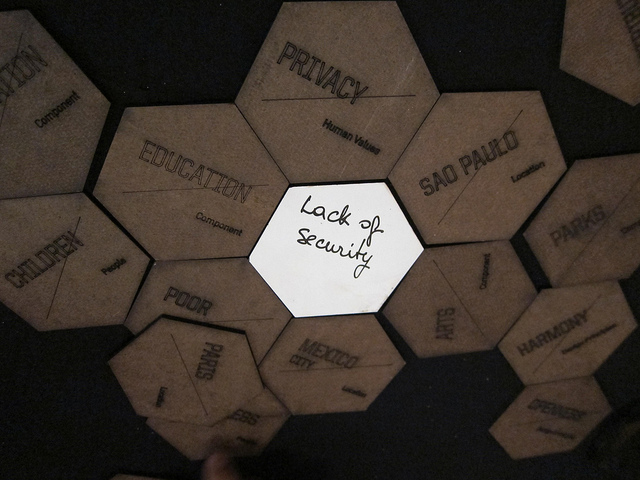 It began with Alessandra Orofino who began by telling us about the extremely impressive work that her organisation Purpose Brasil are doing in Rio de Janeiro, developing social tools to help citizens really engage with governments and their cities. We then moved on to hear from the US Ambassador to Brazil, Thomas Shannon. He talked a lot about the many ways in which the US Government is bringing people to Brazil to help integrate Brazilian cities with both US cities and US counties. I have to say I was a little sceptical about these great US initiatives. The US does not exactly have a good track record in terms of interfering in Latin America and supporting dictatorial regimes, so when Thomas spoke about the great democracies of the US and Brazil, I was more a time for reflection rather than accepting it all at face value, especially given the current situation in the US with citizens being investigated by the IRS and Verizon customers having all their calls recorded. I guess I will leave it up to your discretions as to whether or not this is a good thing, so much US interest in Brazil and what their true motives may or may not be. 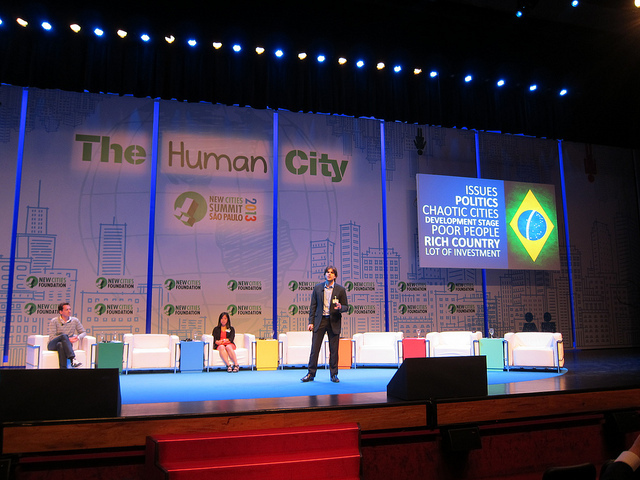 Also on this panel was the mayor of Porto Alegre, José Fortunati who spoke about the initiative which began in the city in 1999 which gave citizens the ability to vote on how the budget would be spent. 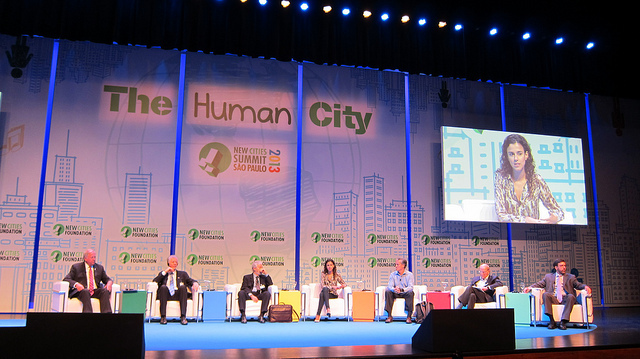 It was fascinating to hear of the sceptical reactions, and how they overcame many objections and challenges, but it does seem that Porto Alegre now has an extremely open form of government, with many of its citizens receiving information on revenues and expenditure and actually being given the opportunity for genuine participation. Alessandra added her opinion by saying that her project gave people genuine decisions and not just a limited set of options provided by politicians in advance. Ezra Suleiman, Professor of International Studies also made some forceful points that politicians have to say that they are for participation, they can not say the opposite, and that we have to “avoid creating sham democracies”. I would have to agree with his observation about “symbolic forms of institutions” which give people the illusion of choice and participation but where decisions have already been made. I think we suffer from this a lot in the UK where our governments launch great “national conversations” which of course are a total sham. 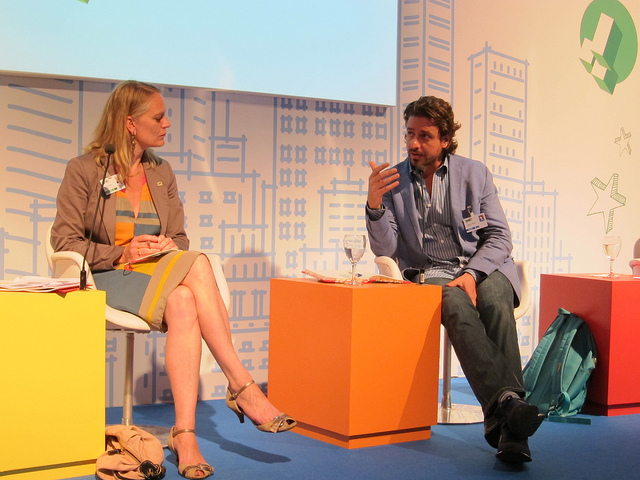 On the private sector side we heard from Pedro Villares, Operational Director of Natura, one of the world’s most sustainable companies, who explained how Natura sees itself as being far more than just a business. Natura has an institute to develop education especially for poor people, for whom a good education can be a root out of poverty. Pedro noted how Brazil ranks 10th out of the worst countries in the world for education, and that education is now “the biggest bottleneck for the country”. I have already interviewed Luís Nortberto Pascoal, President of DPschoal and founder of many different movements and initiatives to develop education in Brazil, and it was great to see yet another initiative in this area from the private sector. 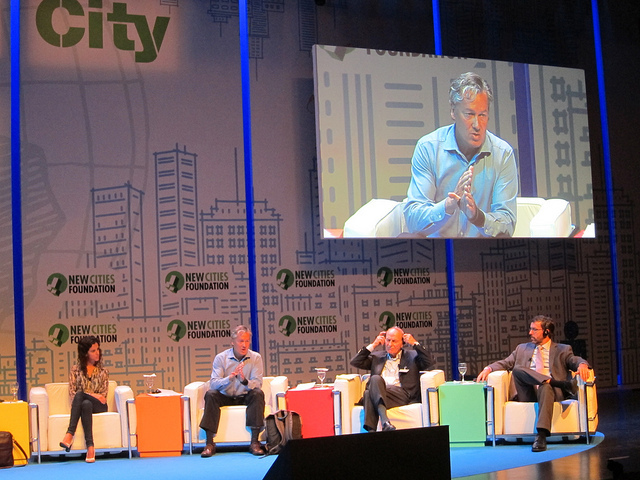 After the panel session came the presentations from the three finalists for the AppMyCity prize. All three finalists presented groundbreaking and extremely well-executed concepts for helping improve quality of life in urban environments, after which the delegates all voted. The winner was Brazilian start-up Colab who are developing a social network for citizens, but both other finalists, PublicStuff and BuzzJourney also received plenty of votes as well. Following lunch there were three more breakout sessions and I went along to the discussion on the future of work, hosted by Greg Lindsay from Fast Company. Architect Edo Rocha who I mentioned earlier spoke about his vision twenty five years ago of developing the now disused railway line left by the British over a century ago. I did not know that this existed, and the vision was to start to migrate people out of São Paulo and into the interior (more rural) parts of São Paulo state. Brazil has suffered greatly from a lack of rail infrastructure, partly caused by car manufacturers in the past successfully lobbying for railways not to be built so that they can sell more cars. It was also great to catch up with Lourenço Bustani, the founder of Mandalah, a very different type of consultancy who help companies and organisations develop strategies which both allow them to grow while at the same time generating social value. Lourenço, for whom the concept of conscious consumption is central, made the key point that a noticeable trend is that people are starting to notice that their personal values are often not aligned with the values of the organisations they are working for. He also noted how some companies are now trying to offer their employees new experiences in other environments, and that other compeanies are developing “silos” which are self-contained organisations within the overall group which have a very different cutlure, in order to promote and encourage creativity. This point was exactly what I had been discussing with my friends over breakfast. While at BT Laboratories doing work in design thinking and usability I was able to undertake one secondment at BT Mobile, the commercial group in London, and then another secondment at BT Cellnet working for the head of Business Development. He then took me on at the age of 26 to be the business development manager responsible for smart phones before smart phones had been launched. In Brazil there is a still a very noticeable hierarchical social structure, and I am not too sure I would have been given this chance in the equivalent Brazilian company at such a young age. My manager, Tony Eales, spent a great deal of time mentoring me, to help develop my commercial skills to complement my design and product skills, and this is something I also do not see happening in Brazil. I then became of one of the co-founders of Genie Internet, the world’s first mobile internet portal. This was a subsidiary of BT Cellnet, and in order to develop and launch at pace we were taken out of the head office and into a rented office in London where we could work as an agile organisation without interference and with just a few contractors who worked on the technical infrastructure. This was the mid to late 1990s and Genie grew while month after month our competitors continued to fail to launch anything similar. (For more information I have written up my case study here). Lourenço stated that “the future of work is non-work” and by that he meant that if you are fully engaged with what you are doing and fully aligned with the purpose and the values of the organisation then work no longer is seen as work, and the workforce can finally be happy. 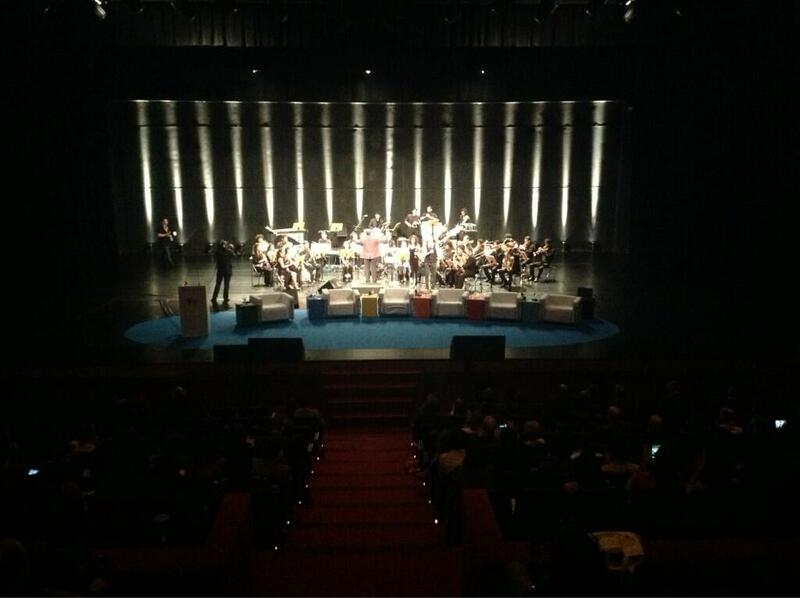 This point was re-iterated by one of the world’s top chefs, Brazilian Alex Atala on the final plenary about play. “People are more happy when sharing their passions”. Alex spoke a lot about the connection chefs have with nature, and it is clear that he has a deep understanding of the role cuisine can play in society at all levels, even the servicing of one of his most popular dishes, mashed potato and cheese can become a performance. The final sessions presented me with another dilemma in terms of which to choose, and in the end I went to the creative session on design hosted by Frog Design, who brought with them their game “Juxtapose” which had been created based on mind-mapping techniques to help capture “experience” and our “sense of place”. It was clear from the Twitter discussions (#NCS2013) that these breakout sessions were generating a huge amount of discussion and dialogue and I only wish I could have attended more. Unfortunately I had to leave due to having an evening engagement, and I was sorry to have missed the grand finale whereby the orchestra were revealed to the audience (a secret Alice had shared with me earlier on, and one I had managed not to reveal). Next year’s summit it was revealed will be held in Dallas, and I am sure the series will grow and continue to bring together many diverse people from a rich variety of backgrounds for more networking, dialogue and discussion. São Paulo continues to be attracting more and more visitors now that Brazil is truly entering the world stage, and this plus the annual Symnetics Strategy Execution Summit are really helping change perceptions not only of the potential here in Brazil, but on how through constructive dialogue like this we can change our consciousness, change our environments and work towards a positive future reality.